Protect hands and surfaces in style with the Lodge pot holder. Lodge's collection of accessories - handle holders, brushes, scrapers, and many more. The fabric lining provides a comfortable grip while the silicone exterior offers maximum heat and stain-resistance. How to season with one hand busy stirring the pot? Every chef knows the dilemma. With the Kalorik Gravity salt and pepper grinders it doesn't get any easier: tilt the grinders over the pot and it does it all by itself. A ball inside the grinder sets the electric grinder in motion once it's angled - all you have to do is pick whether you want pepper or salt. The grinders works for other spices as well. Both, the salt and the pepper grinders are adjustable in fineness and they're easily refilled by lifting the grinder's cap. Stainless Steel finish. Metaltexdesign++ the ultimate collection of main kitchen tools such as ladles, spoons, turners and skimmers; essential gadgets like peelers, can openers, corkscrews and graters to sophisticated utensils like tea spoons and serving sets. A complete assortment for every need at the table and in the kitchen. Metaltex offers a wide assortment of manual-power cooking tools. Metaltex have collected them all in one single collection: Kitchen helpers. A range of tools that perfectly match functionality and ease of use ideal for chopping, cutting, grinding or simply preparing everything you need in a matter of minutes. Designed to satisfy every single need at the kitchen using the manual power, without the unnecessary use and consumption of electricity. Made in high quality materials to withstand everyday use, the collection reveal to be essential in your kitchen thanks to all accessories and tools they provide, making all the cooking tasks much more easier. Preparing and creating from basic recipes to the most sophisticated ones has never been easier, thanks to Kitchen Helpers! 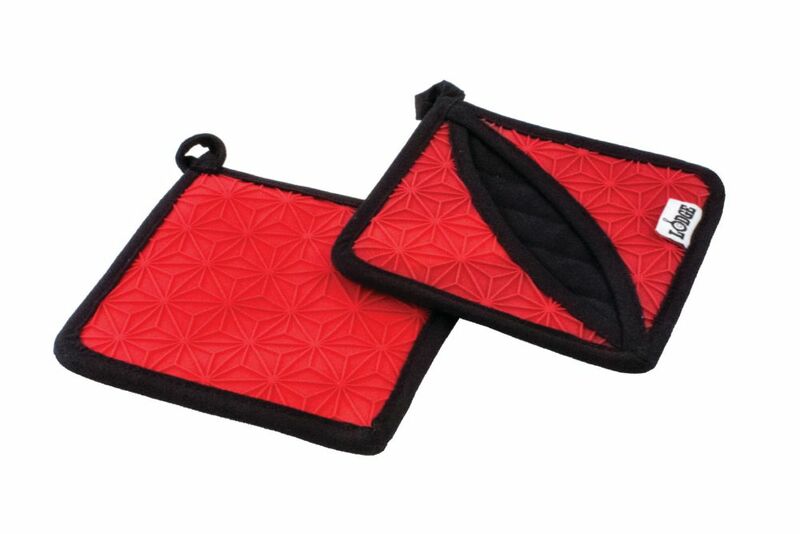 Silicone And Fabric Trivet, Red Protect hands and surfaces in style with the Lodge pot holder. Lodge's collection of accessories - handle holders, brushes, scrapers, and many more.